The 71603B error performance analyzer addresses applications for high speed digital testing up to 3 Gb/s, including R&D and manufacturing test of lightwave components and sub-assemblies, advanced computer technology and high-capacity communication systems. 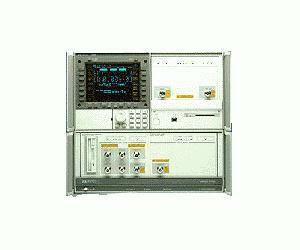 For transmission systems up to 3 Gb/s, such as datacoms and CATV trunk feeds, the HP 71603B and HP 71603B Option 807 error performance analyzers (3 and 1.5 Gb/s) provide a range of PRBS and user-defined patterns with versatile triggering facilities. Powerful application software to speed measurement time. The E4543A Q Factor and Eye Contour application software. Designed to simplify the characterization of high speed optical communication links, automatically calculating the Q figure of merit. The E4544A OC-192/STM-64 application software automatically constructs SONET/SDH frames for functional test of network elements. Features including error and alarm generation plus CID stressing patterns.